Think healthy and be healthy is one of our most important techniques because it deals with your most valued possession- your personal health. Feel better and live a more vibrant life. Become more active as you acquire a new zest for every new day. 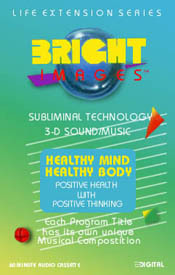 This program is a general "think and be healthy" technique to keep your body's system operating normally. Deals attitude and ideas regarding your health. It transmits positive messages concerning healthy ways of eating nutritiously, exercising for your health, feeling good, being happy and enjoying life. It is designed to create a healthy consciousness within you. Much evidence today points to the fact that healthy thinking does contribute to healthy living. This program develops positive health consciousness.